So this was a crazy busy fun weekend. Friday night we were scheduled to go to a Lake County Captains game. But the radar showed a lot of rain, so we went to plan B- the movies. Well we had a great time at the movies (apparently we would have also had a great time at the baseball game since it never rained. So Friday night Uncle Mike and his girlfriend joined us for dinner and a movie. We went to Crocker Park and had a blast. Dinner was Liquid Planet. They have great smoothies, pitas, salads, rice bowls and more. If you haven't been you definitely should give them a try. It is a nice light and healthy way to do dinner in the summer. So for the movie we had to do Monsters University. The kids have been talking about it since they saw the movie trailer. The movie didn't disappoint. 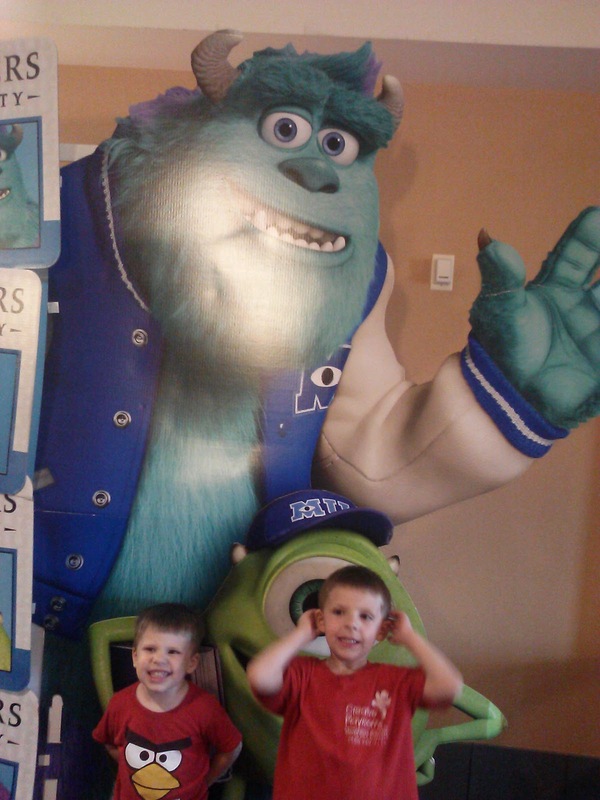 Sulley and Mike were as cute as ever in their roles. There are some great lessons about friendship, working hard and honesty mixed in with some hilariously funny monster amusement. Saturday was another event filled day. Jude had swimming lessons in the morning. Then after a quick stop at Costco and lunch Steve took the boys to the St. Bernadette Festival for some rides and games. They both came home with a "super fast" race car (until they both lost their engines by bedtime). After a short nap we decided to try round two with a Lake County Captains game. The rain held off- thank goodness! We had a yummy dinner and ice cream. The kids got to run with Skipper on the field and then after another sad loss by the Captains, we saw a great post game fireworks show. We started Sunday at church. We then had to get ready for the WECPTA babysitting coop picnic. For those of you that our unaware of what a babysitting coop is, let me tell you they are great. It is basically a group of parents that get together and create a coupon system where by you exchange coupons for babysitting time. Well the Novaks were hosting the picnic this year. We had a great turn out. Jude and Joel had some meltdowns along the way. They are just not used to that many people in out house at once. Joel at least found a friend at the end, Jude not so much. But either way it was a learning experience of things we must work on. The kids were back at Creative Playrooms this morning. Mom got a necessary breather. We need to gear up for the Fourth! Stay tuned for more Novak Family fun to come!